A selection of chamber music (including music for handbell choirs) and works for larger ensembles by Frederick Frahm is featured on this page. For program notes or information about additional chamber works, please contact the composer. “One day, I visited an art gallery to pass the time. Yes, there were paintings of barns and soldiers and bowls of fruit. Yes, there were stuffy portraits and lavish murals and fussy assembled things. In one room, the light was more dim. A single bench sat in the center and on each of the four encompassing walls, there was a single large oblong piece. I don’t remember the artist’s name, couldn’t possibly have been Barnett Newman. Through my eyes, I fell into each mass of color. This music was given its world premiere on March 3, 2018 by the Garth Newel Piano Quartet in a pub performance at the Garth Newel Music Center in Bath County, Virginia. Composed in 2011, may be played as a set, or individually at the performer’s discretion. Total duration is circa 11 minutes. For the trumpeter, it is important that these pieces are less in the nature of a fanfare and more in the manner of a song or aria. Be expressive with the lines, make much use of legato playing, and allow tempi to be broad and unhurried. Organ registrations are designed for a modest two manual instrument without pedal. For performances on instruments of larger specifications, the use of a broader palette of color is encouraged, including an ad libitum employment of the pedal division. A version of the accompaniment for string orchestra is available on rental from the publisher. and bleached bones in a wind hollowed nicho. rain, or the remnants of a spring. and a ghostly frolic of light chases through the canyon. Grendel’s Soliloquy, a concerto movement for violin and organ, existed in sketches for many years before completion in 2013. A first version of the score (2000) was for piano and viola solo. The final version, expanded and recast for violin and chamber orchestra, is available today using the composer’s transcription of the accompaniment for organ solo. The world premiere of this arrangement was performed on 26 January 2015 at St. George Anglican Church, Hanover Square, London, by Robin Walker (organ) and Philippa Mo (violin). The music, in sonata-allegro form, took its inspiration from the 1971 novel by John Gardner. In Gardner’s text, Grendel, the beast in the Anglo-Saxon epic poem Beowulf, tells the story from his perspective. The contrast between the mast-ly tress and the delicate lamenting leaves offered me a metaphor of sorts to work with in writing this music. I wanted both instruments to have their own space and though they are combined not to lose their character or identity. So, in the course of this piece, one or the other instrument has the full spotlight, and at other times they find each other in tandem and conversation. Only just past now, the moment of detachment. And already I am desert. 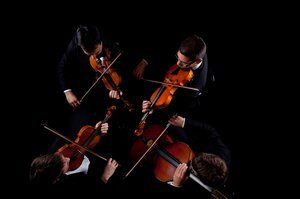 A chamber work for organ and string quartet or orchestra. Inspired by the church ruin at El Misión Nuestra Señora de la Purísima Concepción de Cuarac (Quaraí) in the Salinas Pueblo Monuments in Northern New Mexico, this spare and moving work captures the austerity and grandeur of an edifice that has a rich and troubled history. In ABA form, the music runs about 6 minutes in duration. Completed from older sketches after discovering a collection of charcoal drawings by French Symbolist Odilon Redon (1840-1916). This 20 minute work for string orchestra in three movements seeks to capture musically some of the emotions present in Odilon Redon’s ghostly sketches. There are three organ works so inspired, but made of entirely different music. The style of the music is somewhat tonal and minimal, bearing an obvious synchronicity with the works of Philip Glass. The harmonies move slowly and the use of ostinati serves to propel the music forward to ever increasing densities. The world premiere was performed by the Santa Fe Community Orchestra, Oliver Prezant conducting, on January 15, 2016 at the St. Francis Auditorium in Santa Fe, New Mexico. La Mélancholie (Melancholy), portrays a moodiness that vacillates between melancholy and fleeting hope. L’Ange Tombé (Fallen Angel), a movement of more intensity, responds to a sense of agitation experienced by a seraphic entity who struggles with a self-imposed alienation. Fleur Étrange (Strange Flower), full of harmonic sighs and sweeping melodies, is at the start in a somewhat brighter mood. But the work is drawn inward for a moment into a fugal exposition over a pedal point with ascending minor-sixth intervals suggesting a heavy heart and sighs of sorrow. Eventually, a glimmer of hope concludes the piece in the radiance of a major chord. A 12 minute work in three movements for orchestra inspired by a visit to Fort Union in Watrous, New Mexico. The old abandoned fort, once a bustling center of activity in the American Civil War era, is now an eerie camp of deteriorating adobe buildings surrounded be a vast plain and remnants of the Santa Fe trail. The world premiere was performed by the Santa Fe Community Orchestra, Oliver Prezant conducting, on December 12, 2015 at the St. Francis Auditorium in Santa Fe, New Mexico.